Brexit is happening and all those affected should be trying to make the best of it. Yet Irish and Scottish nationalists seem intent on seeking party advantage through negativity and an Anglophobia that grown-ups grew out of long ago. And now British Prime Minister Theresa May has called an election. Mrs May is unknowable. An only child, who lost her parents in her mid-20s, and is herself childless, although she has intensely loyal (and brutal) aides, she has no intimates other than her husband Philip, whom she met at university. The pair are a prime example of what Kurt Vonnegut named a "duprass", a pair who need no one but each other. Confident and single-minded, she lives by the Christian virtues imbibed in an Oxford vicarage and has succeeded because of her appetite for hard work, her refusal to be pushed around and her stubborn determination to see every job through to the end. The job of Home Secretary is agreed to be the most difficult in British political life, and Mrs May was one of the longest serving ever, described by one junior minister as "a fierce manager of her team" who commanded meetings "by sheer force of personality" and never "let an issue go". Diagnosed in 2012 with type I diabetes, she has four daily insulin injections and was foolishly dismissed on health grounds by many as a potential successor to David Cameron. Although she has a reputation for caution, she also takes the occasional big risk. It was Mrs May who told the Conservative annual conference in 2002 that some people called it "the nasty party", which offended many but accelerated reform and modernisation. Having campaigned half-heartedly for Remain, it was Mrs May, who on becoming Prime Minister announced firmly that "Brexit means Brexit", by which she meant there would be no backtracking. And although she had ruled out an early election, she changed her mind on a walking holiday with her husband and called one three years before it was necessary. 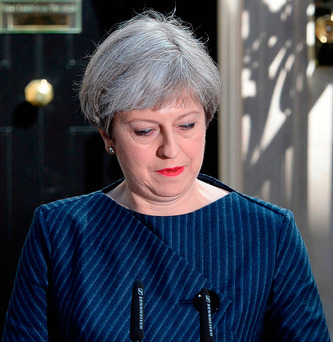 She had only a small Commons majority and her negotiating position with the EU was being undermined by Tory Europhobic MPs opposed to any compromises and a truculent Remainer-dominated House of Lords who said she had no mandate to leave the single market or the customs union. And, of course, opinion polls suggested that the Labour Party under Jeremy Corbyn appals the electorate. For those who want Britain to get the best deal possible for the United Kingdom and for Ireland and the EU as an entity, the best outcome is that Mrs May ends up with a solid majority (which would have the Conservative party on its best behaviour) but not a landslide (which would be a breeding ground for arrogance and plotting). From her perspective, the right result will mean that she can focus on negotiations and implementation without endless firefighting back home. It's hard to see any result other than a clear Conservative majority, but there's a chance that the Liberal Democrats could stage a revival on a Remain platform. But no one thinks a Labour/Lib Dem/SNP coalition would fly. Where does this leave Ireland? Almost certainly dealing with a strengthened Conservative government, which shouldn't worry anyone sensible. There's genuine concern in Westminster about the effect of Brexit on Ireland, north and south, and a strong desire to make the effects as painless as possible. It's a priceless asset that British and Irish politicians, civil servants and diplomats have such a history of cooperation over Northern Ireland and, more importantly, in the EU, where they've been allies. Trust matters, and both governments know that when it comes to the deal to be got from the EU, their job is to informally agree mutually beneficial solutions to the problems faced by the island of Ireland. The EU isn't going to punish the UK if the result would be to devastate the well-liked Irish republic. What is counterproductive is the hysteria of some of the SNP, all of Sinn Fein and, sadly, Colum Eastwood, leader of the SDLP, who showed an almost comical level of Northern-Ireland-centredness in his denunciation of Mrs May for demonstrating her "disdain" by calling "a snap Westminster election in the middle of intense efforts to restore the Government''. Look, guys, Northern Ireland is not the centre of the universe, its population is only 3pc of that of the United Kingdom, the tribalism evident in the recent election won few admirers, the talks are a farce, and Mrs May is rightly focusing on Brexit. Celtic screaming to be allowed to stay in the EU is a distracting waste of time in Ireland, as it is in Scotland (8pc). The English public (84pc) is sick of the grievance-mongering of heavily-subsidised Celtic nationalists. It's time for them to grow up.